Broker Stockpair showed us, once again, that it’s one of the best brokers out there and they introduced a new options trading style. It’s the first broker to ever introduce KIKO Options. It’s a binary options trade that fits somewhere between touch and classic high low options. How do KIKO Binary options work? A trader chooses between CALL or PUT, just like with a regular option. Therefore we speculate whether the price touches a certain point above or below the actual price. The twist is that we are not bound to time. If the price doesn’t touch a certain point even in, let’s say, 10 hours and doesn’t really move much, the trade is still opened. The profit that stockpair offers for the winning trade isn’t bad either. It’s between 77 % and 82 % depending on the asset. What does KIKO really mean? KIKO is an abbreviation from the words Knock in and Knock out. Knock in and Knock out are imaginary lines (price level) that are quite important to us. The Knock in line is a level that when the price touches, makes the option expire ITM. Knock out line, vice versa, mean a losing trade. 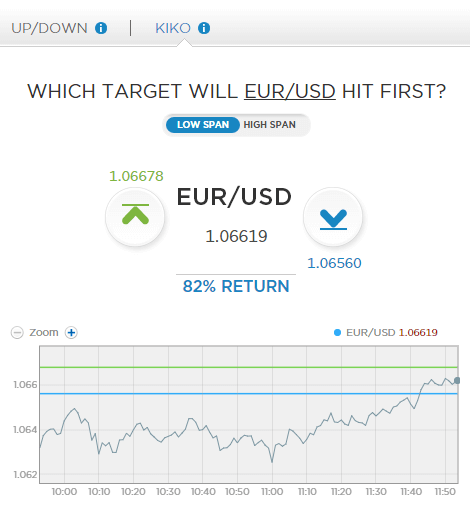 KIKO options are a new and simple trading instrument in which the trader predicts which of the upper or lower price targets (barriers) the asset price will hit first. If it first hits the price target that the trader has chosen (Knock-In), the option will expire “In the Money” (ITM) and they will receive a payout. If the asset price first hits the opposite price target, the option will expire “Out of the Money” (OTM) and there will be no payout.